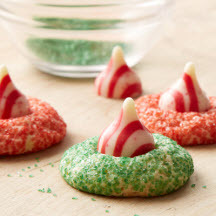 Red and green sugar crystals and mint-flavored candy cane Kisses colorfully dress up classic thumbprint cookies for Christmas. Preheat oven to 350°F (175°C). Remove wrappers from candies. Beat butter, granulated sugar, egg and vanilla in large bowl until well blended. Stir together flour, baking soda and salt; add alternately with milk to butter mixture, beating until well blended. Shape dough into 1-inch balls. Roll in red sugar, granulated sugar, powdered sugar or a combination of any of the sugars. Place on ungreased cookie sheet. Bake 8 to 10 minutes or until edges are lightly browned and cookie is set. Remove from oven; cool 4 to 5 minutes. Press a candy piece into center of each cookie. Remove from cookie sheet to wire rack. Cool completely.